ca 420 - 410 B.C. Side A: The Argonauts in the garden of the Hesperides (see other image). 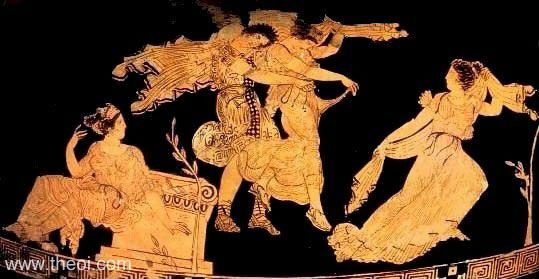 Side B: The Dioscuri seize the Leucippides, abducting the maidens as their brides (only one of the pairs is shown in this image). Aphrodite witnesses the scene seated beside an altar. Her attendant Peitho (Persuasion) flees--for persuasion has been replaced by force.